Teriyaki salmon baked in foil under a layer of mushrooms makes for a quick and healthy weeknight meal. Essentially, you are steaming the meal in a foil packet. This method comes from the French method called en papillote, which traditionally uses parchment paper to make the packets. Both foil and paper work fine for cooking en papillote. The benefits of using foil are that it is easier to get a tighter seal and it handles liquids better. The advantage of parchment is it can make for a beautiful and fun presentation. For a one pound fillet of salmon baked in foil, tear off 20" of foil, fold it in half and place it on a baking tray. Brush one side of the foil with olive oil leaving about 3" around the edges unoiled. Place the salmon skin-side down on the the foil near the fold, season with salt and pepper. Add the mushrooms and drizzle the remaining sauce over the salmon. Leaving some air between the food and the foil, fold the three open edges over on each other a couple times to get a good seal. Air provides room for the salmon to steam. The final product will be a rectangular package. 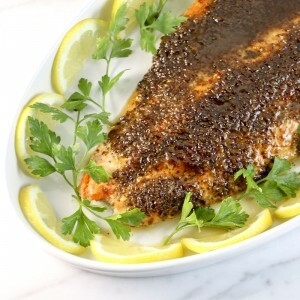 This example below uses parchment to bake chicken and asparagus, but it will also work for this salmon baked in foil recipe. For cooking in parchment paper, tear off a 24" piece of parchment. Fold it in half and cut a rounded edge half oval shape. Baste the bottom half of the paper with olive oil leaving 3 -4 inches around the edge without oil. 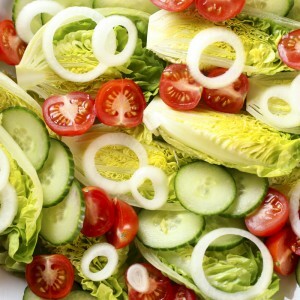 Place the protein and vegetables on the bottom half of the circle near the fold. Seal the outer edge of the packet by making a series of small folds, one on top of the other beginning at the top edge of the packet next to the fold. The sealed package will puff up and darken a bit in the oven. Parchment paper is safe to cook with up to 425 degrees Fahrenheit. To serve, cut an x in the top of the parchment packet and place on a plate. Guests can open up their individual packets at the table. 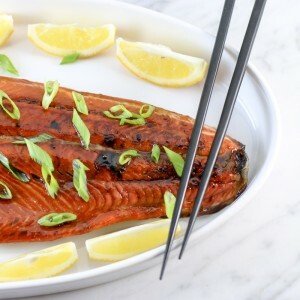 Whether you are making this Teriyaki Salmon Baked in Foil with Mushrooms or a variety of protein and vegetable dishes, cooking en papillote is a quick and easy method suitable for a weeknight meal or an easy dinner party. Salmon baked in foil with mushrooms is a quick and easy weeknight, healthy meal. This recipe provides for cooking en papillote for either foil or parchment. Heat the oven to 400 degrees F. Combine the first 7 ingredients in a bowl big enough to hold the sauce and the sliced mushrooms. Add the mushrooms to the sauce and toss with your hands so that the mushrooms are well covered with sauce. Set aside. Tear off 20" of aluminum foil, fold it in half and lay it on a baking sheet. Baste the bottom half of the foil with a little olive oil so the fish doesn't stick. Leave 3-4" around the edge without oil. Place the salmon skin-side down on the foil next to the fold, leaving plenty of toom around the edges to create a seal. Season with salt and pepper. Layer the mushrooms over the salmon and drizzle the remaining sauce over the stack of salmon and mushrooms. Tightly seal the edges all the way around by folding the edges over on top of each other a couple times. A tight seal is important. Make sure to leave some air space between the salmon and the foil so the food has room to steam. Bake 15 - 25 minutes, depending on the thickness of your salmon. For a fillet that is 1" thick, 20 minutes is usually enough time. Remove the fish from the oven and turn on the broiler. Open up the foil to expose the top of the fish and place under the broiler for 2 - 3 minutes. Garnish with lemon slices and parsley. This recipe serves two people. You can make the fish in a single packet or you can cut the fillet in half and make two individual packets.